A tropical spin on plain old pancakes, these piña colada pancakes are made with coconut milk, coconut chips and fresh diced pineapple. 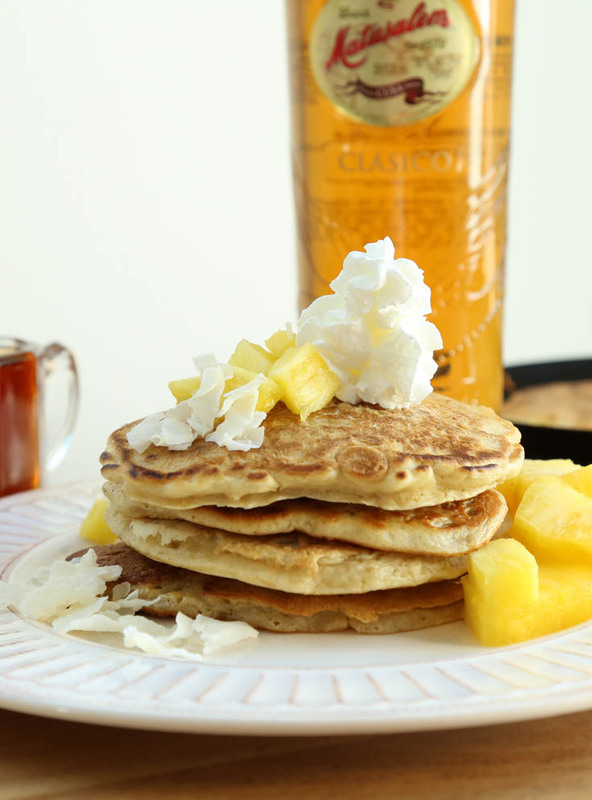 The rum is mixed into warm maple syrup so the pancakes themselves are alcohol-free and safe for small children. Finally a holiday breakfast the whole family can enjoy! And by that I mean, one which gives the grownups a good jumping off point to start down the slippery slope of seasonal alcoholism. In a medium bowl, whisk egg with coconut milk, sugar and vanilla. Add dry ingredients and stir until almost combined. Add pineapple and mix well. Cook on greased griddle over medium heat, using 1/4 cup batter for each. Turn when bubbles have appeared on surface and edges look dry. Serve right away or keep cooked pancakes warm on a baking rack in a 200ºF oven. Warm syrup in a small pot over low heat, stir in rum just before serving. Well, here we go again! Once again, I’m going to have to expand my holiday menus. Since I’ve already planned to have bananas foster-style french toast (with a rum pecan syrup) on Christmas morning, there’s now going to have to be a special Christmas Eve breakfast to serve these. It’s great that I can use more rum because I’d hate to have to make cocktails with the remainder of the rum :). BTW, Ron Methuselah is great! It used to be my go-to Cuban style rum until I decided that Flor de Caña in the 1.75 liter bottles is an unbeatable super great deal. Interestingly, the only cocktail I could think to make with the pineapple bitters I made is a piña colada. I’ve wanted to try them in food, but my imagination just failed me, until now. As long as you’re already cooking with booze why not add bitters? It’ll be interesting to see if I need to tweak the bitters recipe. Let me know how the bitters works! I bet it will be a nice note in the syrup. 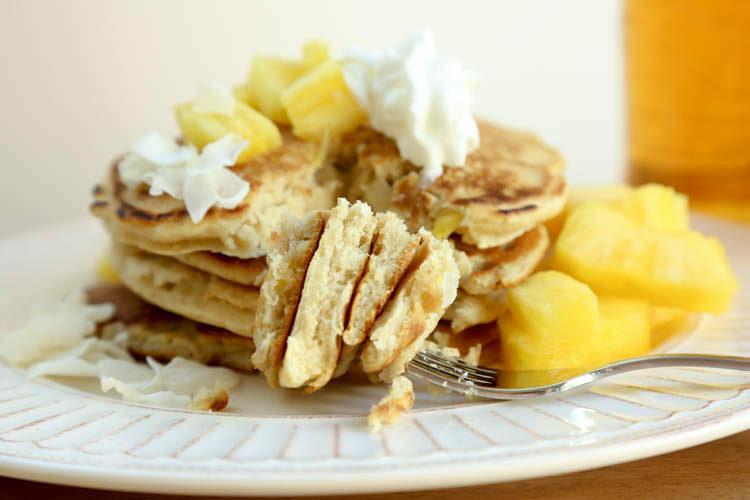 Hilah, there’s a product called Hawaii’s Best hawaiian coconut syrup that would be perfect for your pancakes. It’s really tasty and you can order it on line.